More for keeping track myself - I never know how many things I actually have going on at once. Recolors of Cynnix TSM crown conversions - I've dropped my medieval hood, so I have less use for them now. I still plan on finishing them. Medieval Dye Actions - Again, with no medieval hood, I've lost a lot of momentum here. However, I think they still will have useful application as color actions for creators. I'm about a third done and am still fiddling with making them layerable. Completed! The other day, I was doing yet another search for extracted textures from THIEF to no avail, but I ran across something even better. This awesome person named C-Beam had updated all the textures for Thief II: The Metal Age in high-res glory! These are the ones I've been fiddling with myself for the Imbris Analects project, and now they're all here and beautiful and all I have to do is the "put them in the Sims" part. SO! I made something for the Conversion Immersion Garden of Shadows event using these new beauties - the Art Deco collection! Now you can have proper Mechanist cathedrals. I'll eventually get things reorganized here and also on the Simblr, but that's where it is for now. In other news, Steam ran an Eidos-palooza sale, so I snagged THIEF for under $8 - for the specific purpose of extracting stuff. The game won't even run on this machine. After a half day of fiddling with various extractors, I found one that works, so there might be a slew of THIEF conversions coming too. 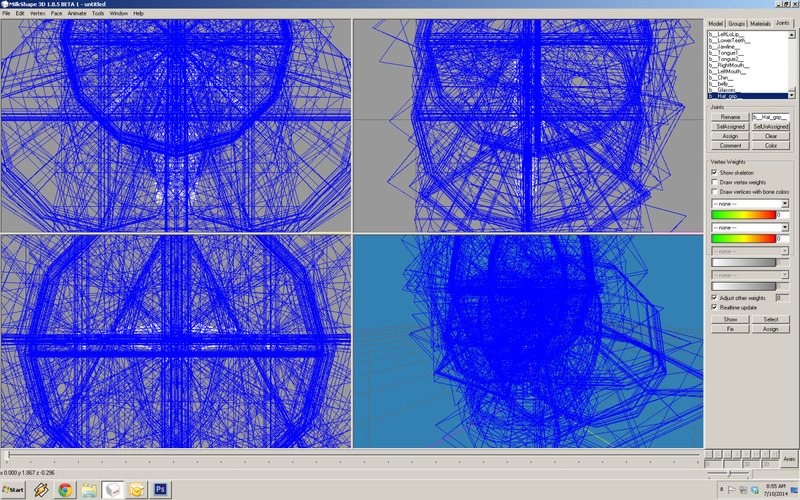 If I'm feeling brave, I might even fiddle with a mesh or two. HA HA HA HA. Shadowfell's Natural Dyes Photoshop Actions Released! Over a year ago, I came up with the idea for Photoshop actions based on natural dyeing methods. I was aiming for the more historical side of the Simming community, but I think they' could be useful to anyone. I researched old dyeing techniques as well as modern, learned about the different kinds of mordants to pretreat your textiles and how they influenced the final color, discovered what fabrics dye well and what doesn't, and just where all these wacky dyes came from. And I won't bore you with all those details. I changed the name from 'medieval dyes' to 'natural dyes' as some of these aren't specifically medieval, and of course, depending on the part of the world you live in you might have access to dyestuffs that others don't. These are all historically represented at some point or another. The cool thing is you can still use these methods and dyes today, which is how this set came to be. I found examples of the colors (and the mordants used) usually in hand-dyed yarns and from there I simply used the color dropper tool to select what colors I wanted to use in the actions. These are as close as I could possibly come to representing these dyes (with a little interpretation in the rest of the actions, of course) without dyeing things myself and taking my own pictures. On the credits page, you can see what links I used for the colors themselves, as well as a bunch of links to historical dye information or even dye products you can buy. These are made for dark textures. I had velvets firmly in mind when I made these (and I built them on Sherahbim's textures so yeah) but any mid-to-dark level texture should come up with pleasing results. The color swatches were all run on a square of #333333. You can also run these on black and still get very muted colors. So, if you're looking to use these for light cottons and what not, you'll simply want to "Step Backward" after running the action and tweak the individual settings to get the vibrancy you're looking for. I've included a tutorial on how to do so if you've never actually messed with actions in this way before (I take apart everything and use nothing as-is, but that's just how I am), and also how to do a basic overdye, where you run one action and then run a second color over it. The results of that are obviously not going to be authentic, but you might come up with an awesome color you'll want to recreate later. Before I plop up the download link, I wanted to talk about some more credit-type things. Inspirations as you will (these are all on the credits page as well). First off, these would never have come to be without the great inspiration of hat_plays_sims, better known as The Almighty Hat. She makes such lovely historically accurate (as possible) beautiful clothing, hairs, defaults, etc. for the medieval side of things and I wanted to dedicate this set to her. You rock, Hat. Secondly, to Pooklet, CuriousB, Aelia, Anna, Shastakiss, Trapping, AlfredAskew and the dozens of others who have either made color actions or palettes for us Simmers to use. It's great to have so many quality resources available in the community and I think you're all awesome. Now on to the download stuffs. The files includes the actions file, a .pdf tutorial on how to use them (and some rambly historical bits at the beginning - not much), a couple of color swatches (the one above and a second set done on a very dark leather texture), and a text file with credit information (the last page of the tutorial has these too). Policy wise - my standard thing applies. No paysites, no claiming as your own, otherwise go nuts. Edit: Hex Chart available HERE for GIMP users. 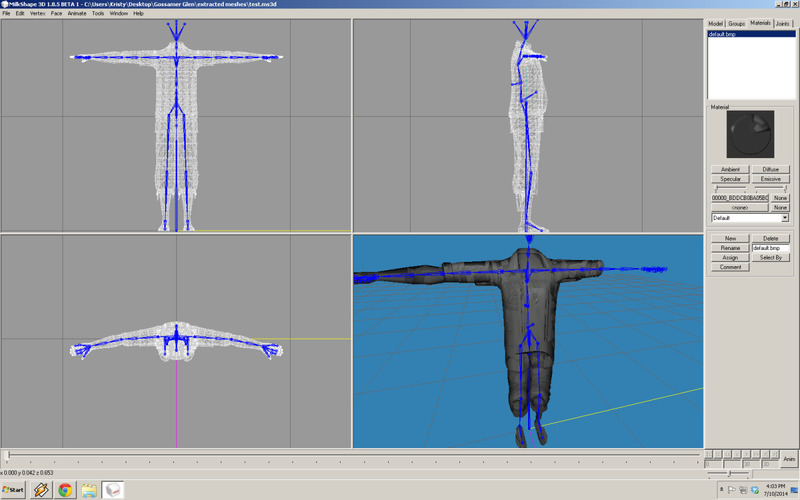 If you’re trying to convert clothing and Milkshape can’t find the bone file, this is what it looks like. So then how do I figure out where the shoulder joints are? And after much other stupidity, I have this. So it's something. This is a Master post for my Thief conversion project, "The Imbris Analects". Also coming: The Forgotten Library, Stone and Brick, and something involving textures slaved to Buggybooz's Niches and everything attached with that. Or anyone else who wants to tackle these. I downloaded a crap ton of extracted models and textures from Bioshock from facepunch.com before they locked all the forums from non-members. If anyone would like to download these and poke around with them in whatever meshing program they prefer, please be my guest! I've been meaning to get back to these myself. Warning: These are pretty big .rar files.